to dantange, moisturize, smooth and make hair shine. Transform your rebillious hair with our moisture and breakage conditioner. T.M. Emergencia balances sweet smelling coconut, along with other highly effective ingriedents to dantange, moisturize, smooth and make hair shine. Ingredients: Distilled water, glycol distearate, cocamide mea, laureth 10, diazolidinyl urea, iodopropynyl butylcarba mate, trimethylammoniumchloride, cetyl alcohol, coconut oil, hydrolized wheat protein, hydrolized silk, methylparaben, propylparaben, fragrance, red 40, (CI 18035), blue1 (CI 42090), yellow 5 (CI 19114). 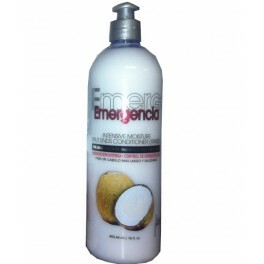 hair treatment will nourish your hair and moisturize your hair and scalp. Its moisturizing cleansing formulation will not leave an oily residue. You can also brag about your clean, soft, silky and shiny hair.